Where could you have seen a live band, a bearded woman, and Sustainable Flatbush?? At Brooklyn College’s Student Center’s Welcome Back Bash on October 6th, 2009. Campus Road was closed down and filled with tables of student groups and community organizations, games, street performers from Circus Amok, and live music provided by the Pimps of Joytime. 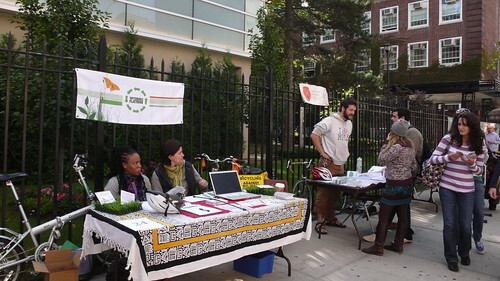 Sustainable Flatbush provided Brooklyn College students and neighbors with information about the goal of our organization as well as our four initiatives. At the Welcome Back Bash Sustainable Flatbush invited Sam from Transportation Alternatives, who informed people about the organization’s advocacy for bicycling, walking, and public transit; Rommel from Recycle-A-Bicycle, who was able to put many students’ bikes back into tip-top shape; and master composters from Brooklyn Compost Project, who encouraged students to learn about worm composting.Community gardeners from Brooklyn College’s Campus Road Garden were there to make students aware of the proposed demolition of the garden and solicit signatures for their petition to save it. They also took students and neighbors on walking tours through the garden’s peach trees, figs, pumpkins, mums, and much more to make them conscious of the garden’s existence. With music in the background and students playing basketball, Sustainable Flatbush was able to educate students about sustainable living. Questions about urban gardening, composting, bicycling, and many more were answered. People were able to pick up information on Sustainable Flatbush events and projects, New York City bicycle maps, and Biking Rules pamphlets. If you missed the bearded woman get out of a straight jacket, a man string himself through a wire hanger, a woman swallowing swords, all the fun and music, and most importantly Sustainable Flatbush, there will be another Welcome Back Bash in Spring.